Plans have been submitted to reconstruct an Iron Age roundhouse near the site of the discovery of a major settlement in southern Scotland. Julia Muir-Watt, of the Whithorn Trust, described it as their "most ambitious public archaeology yet". It follows the discovery of the remains of a group of roundhouses at Black Loch of Myrton thought to date back to the fifth century BC. The scheme has already secured £87,000 of Heritage Lottery Funding. A planning application has now been lodged to create a replica roundhouse close to the dig site for use as an educational and performance facility. The Whithorn Trust was the community partner in AOC Archaeology's excavation of a large Iron Age settlement near the town last year. "The settlement is the largest lochside village so far discovered in Scotland and has yielded finds never before seen from the south west of Scotland Iron Age," Ms Muir-Watt said. She said that because it was a wetland site it meant the timber was in a "remarkable state of preservation". "The roundhouse excavated last year was exceptionally large, over 13 metres in diameter, and is one of seven or eight on the site," she said. "The finds are still in post-excavation but should ultimately enable archaeologists to build a much more complete picture of the south west Scotland Iron Age than from any other site." 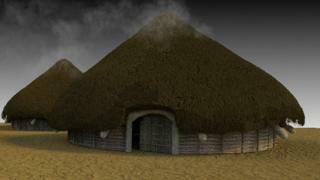 Excavations will continue this summer and plans have now been lodged with Dumfries and Galloway Council to recreate a roundhouse. Ms Muir-Watt said it would be "based entirely on the finds at the Black Loch, and using all authentic materials". "Craftsmen will work with archaeologists and the public, schools and students, to create the massive structure, which has to be floated on a steel subframe to protect the archaeological layers beneath," she said. "This is the design challenge which the architect and engineer have been grappling with over the last couple of months." She said academics from the University of Edinburgh had been debating prehistoric roof structures and the project would allow them to "experiment with prehistoric architectural techniques and tool use". A full-scale working hearth will also allow a "prehistoric cooking experiment" and it is hoped the site can attract school groups, visitors and craft exhibitions and workshops. "Accompanying the construction, a new prehistoric and architectural app will be developed by local young people, to guide visitors round the site, through 3,000 years of buildings," said Ms Muir-Watt. She said the the project would allow the trust to "juxtapose the native wooden roundhouse with the site of the very first Christian church" in the area. If planning permission is secured it is hoped the reconstruction work - also backed the SSE Community Fund - can start in the summer.